Blueberries are nicknamed so appropriately: Nature’s Candy. They’re like little blue bursts of delicious, subtle sweetness. And it’s amazing that, nutritionally, they pack such a punch!! Of all the ‘super fruits’ out there, they boast one of the highest levels of antioxidants. Another no-brainer for British Columbians is to purchase BC Blueberries from our local farmers. Why not support one of our own and boost the local economy at the same time?!! BC Blueberries are available at just about every single grocery store (frozen and fresh)…so next time you’re shopping for ‘blubes’, make a point of looking for ‘British Columbia’ on the label and find them at the farmers markets. They’re there!!! 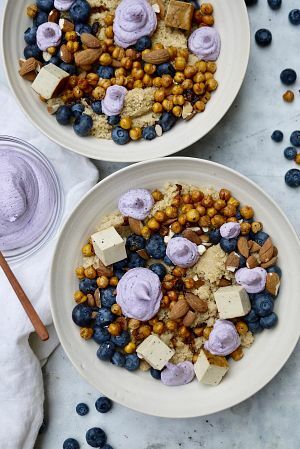 Bowls are a go-to dinner in my home and I love combining sweet and savoury ingredients — they really take each other to the next level. This bowl was loosely inspired by the classic Strawberry Spinach salad, commonly made with toasted nuts, soft cheese, and of course, berries. 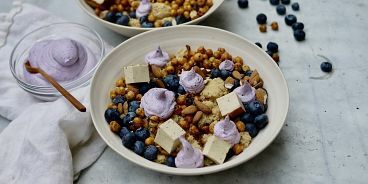 Here, BC Blueberries are the star, and they are delicious with a super easy-to-make (no waiting involved) dairy-free ricotta, salty chickpeas and lemony couscous. Hope you enjoy as much as I do!! Sprinkle of poppy seeds (optional). Preheat oven to 400F. Drain chickpeas and rinse well with water. Dry them completely with a tea towel. Place chickpeas on parchment-lined baking sheet, drizzle with olive oil and sprinkle with salt and pepper. Toss with your hands so they’re evenly coated. Roast in oven for about 28 minutes (until golden brown and crunchy). Toast the almond by placing them in a dry pan on medium heat for a few minutes (until fragrant). Add all ingredients to a blender and puree until smooth. This could require using your tamper tool. Place desired amount of couscous in the base of your bowls and drizzle with lots of lemon juice. 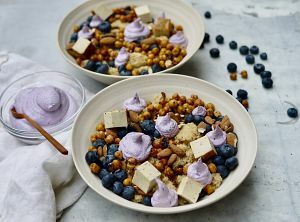 Now, add BC blueberries, crispy chickpeas, toasted almonds, tofu cubes. Add blueberry ricotta to a small ziploc bag and snip off one of the corners with scissors (this is your piping bag). 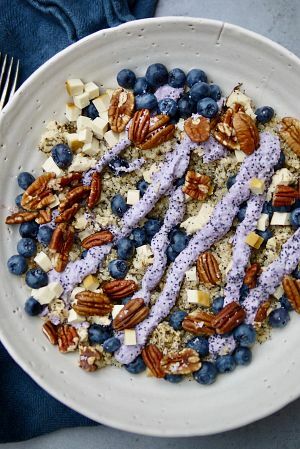 Squeeze dollops of blueberry ricotta around the bowl, or drizzle using a zig-zagging motion. Sprinkle with poppy seeds if desired. *Feel free to half the vegan blueberry ricotta recipe if you don’t want leftovers and if you have a small blender container (my Vitamix is too large to make small recipes). 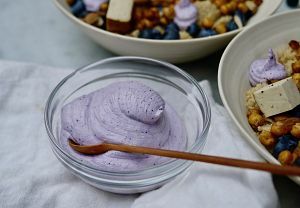 For more recipes and information about BC Blueberries head to www.bcblueberry.com. Thanks to BC Blueberries for sponsoring this post!!! All opinions are my own.